Rain, Flowers and Macro are possibly my most favorite combinations when it comes to photography. 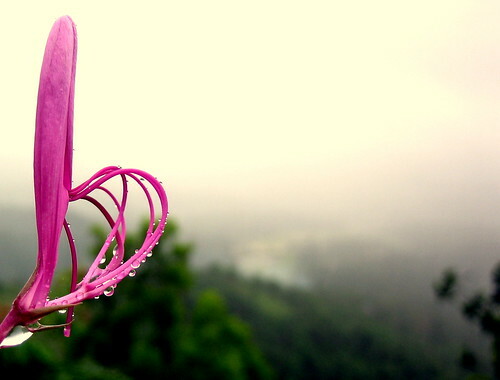 This photograph was taken during a brief rain shower at a famous tourist spot in Kodagu(Coorg) called “Raja’s Seat“. This was my third visit to the destination also known as ‘the Scotland of India’ and by far the most rainiest of my visits… Kodagu has a very different feel when visited in different seasons and while the rain meant a little discomfort, it also provided some picturesque moments and a lot of tranquility. This entry was posted in Photo and tagged Family, flower, Kodagu, macro, photo, photography, rain, Rain Drops, Raja's Seat, Tourism, travel, Trip. Bookmark the permalink.